Peter Wylde. Photo By: Isabel Kurek. Wellington, FL – January 20, 2014 – This Sunday the inaugural Horses Healing Hearts Sunshine Series Jumping Clinic with Peter Wylde will take place at Sunshine Meadows. The world leader in equine nutrition, Cavalor, will sponsor a luncheon: ‘Secrets of a Winning Program’. The luncheon is open to all clinic riders and auditors, as well as interested parties. It will run from 11:30 a.m. – 12:30 p.m. where Olympian Peter Wylde will give a pre-clinic talk and conduct a question and answer session. Wylde will expand on the specific feeding and training programs he has developed at Mullenders & Wylde Horses, Inc., which has been extraordinarily successful over the past 20 years. After the ‘Secrets of a Winning Program’ Luncheon, The Sunshine Series Circuit will kick off with the jumping clinic by Peter Wylde. The clinic this Sunday, January 26, will offer three, 90-minute sessions with four riders in each. Levels are as follows: beginner (2’3 – 2’6″), intermediate (2’9″ – 3′) and advanced (3’3″ – 3’6″). Spots are filling fast, and now is the time to register before you lose this opportunity to train with the industry’s best. One hundred percent of the net proceeds of the clinic are benefiting Horses Healing Hearts; fees are as follows: $200 per rider and $25 per auditor. Please contact Liz Olszewski to reserve a spot today by e-mailing liz@hhhusa.org. The jumping clinic is set to take place at 1 p.m. on Sunday at Sunshine Meadows in Delray Beach, FL. The sessions will each run for an hour and a half. Beverages and food will be available for all attendees. For inquiries about trailers or stabling, please contact Liz Olszewski liz@hhhusa.org or text 561-713-6133. All proceeds will benefit Horses Healing Hearts. Horses Healing Hearts is a 501(c)3 not-for-profit organization dedicated to bettering the lives of children of alcoholics and substance abuse through equine experiential learning. To learn more about Horses Healing Hearts or how you can help with donations of money or time, go to www.HHHUSA.org or e-mail Olszewski at liz@hhhusa.org. Merge onto Florida’s Turnpike S toward Miami (Portions toll). Take the SR-806/Atlantic Ave exit, EXIT 81. Turn right onto W Atlantic Ave/SR-806 W. If you are on W Atlantic Ave E and reach E Tranquility Lake Drive you’ve gone about 0.2 miles too far. Turn left onto US-441 S/SR-7 S. In 1.6 miles turn right onto Winners Circle. 16668 WINNERS CIR is on the left. Take the SR-806 W/Atlantic Av exit, EXIT 52. Keep right at the fork to go on W Atlantic Ave/SR-806 W. Turn left onto US-441 S/SR-7 S. US-441 S is 0.5 miles past Half Mile Rd. If you reach 105th Drive S you’ve gone about 0.5 miles too far. Turn right onto Winners Cir. Turn left to stay on Winners Cir. 16668 WINNERS CIR is on the left. Information: Contact Liz Olszewski to reserve a spot, first come, first served. Peter Wylde attended a Horses Healing Hearts session where he interacted with the children and experienced the program first-hand. Wellington, FL – January 14, 2014 – It was only four months ago that Olympic Gold Medalist Peter Wylde joined Horses Healing Hearts (HHH) as their first Show Jumping Ambassador. After attending an HHH Saturday Session last month, Wylde made the decision to step forward as a clinician for the all-new Sunshine Series Jumping Clinic to be held Sunday, January 26, 2014 at Sunshine Meadows in Delray Beach, Fla. It was a direct result of his time spent with the children during that Saturday afternoon that led him to step forward for the first clinic of the series. The Sunshine Series Circuit will kick off with the jumping clinic by Wylde and will be followed by three show dates to be announced in the near future. Peter Wylde’s clinic on Sunday will offer three, 90 minute sessions with four riders in each. Levels are as follows: beginner (2’3 – 2’6″), intermediate (2’9″ – 3′) and advanced (3’3″ – 3’6″). One hundred percent of the net proceeds of the clinic are benefitting Horses Healing Hearts; fees are as follows: $200 per rider and $25 per auditor. Please contact Liz Olszewski to reserve a spot today by e-mailing liz@hhhusa.org. There are more than 28 million children of alcoholics living among us, but HHH is the first non-profit of its kind, helping to ease the pain of kids growing up in a home with substance abuse. Horse Healing Hearts provides these children with the opportunity to help heal emotionally by working with horses while having fun and learning positive life-coping skills, responsibility and confidence. Using equine experiential learning, HHH is the only program in the nation that works with the specific demographic of children of alcoholics and addicts. These gentle giants help them understand life, themselves and how to cope with their parent’s addiction to substance abuse. Wylde first made his national mark in the equestrian world when he was 17 years old. He rode to the United States’ highest junior honor when he captured the Rolex-Maclay National Equitation Championship at the National Horse Show in Madison Square Garden. His nationally acclaimed win was only the beginning to a long list of accolades ahead. Since then, he has won some of the most prestigious titles in the world of show jumping including the President’s Cup at the Washington International Horse Show, the $100,000 Rolex/USET Show Jumping Championship at the Bayer/USET Festival of Champions, the $50,000 FedEx Gold Coast Grand Prix and a Grand Prix at the FTI Consulting Winter Equestrian. During the 1990s he was chosen to represent the United States in World Cup competition and at the Pan American Games, where he won both team and individual silver medals in 1999. That year he was named the United States Olympic Committee’s Male Equestrian of the Year. In 2002, Wylde and Fein Cera represented the United States at the World Equestrian Games in Jerez, Spain, where they won the individual bronze medal and Fein Cera earned the coveted “Best Horse” honor. In 2004, the pair was again chosen to represent the United States at the Olympic Games in Athens, Greece, where they won the team gold. Wylde is the Head Clinician and Vice President of the United States Hunter Jumper Associations’ Emerging Athletes Program, which seeks to identify and cultivate equestrian talent and reward horsemanship skills to aspiring young professionals. Together with Eduard Mullenders, Wylde runs Mullenders & Wylde Horses LLC, a Millbrook, New York-based training operation for top level horses and riders with a concentration on providing the highest level of care and training for the horse. The jumping clinic is set to take place at 1 p.m. on Sunday, January 26, 2014 at Sunshine Meadows in Delray Beach, Fla. The sessions will each run for an hour and a half. Beverages and food will be available for all attendees. For inquiries about trailers or stabling, please contact Liz Olszewski liz@hhhusa.org or text 561-713-6133. All proceeds will benefit Horses Healing Hearts. Horses Healing Hearts is a 501(c)3 not-for-profit organization dedicated to bettering the lives of children of alcoholics and substance abuse through equine experiential learning. To learn more about Horses Healing Hearts or how you can help with donations of money or time, visit www.HHHUSA.org or e-mail Liz Olszewski at liz@hhhusa.org or call (561) 713-6133. Peter Wylde at the 2013 Winter Equestrian Festival aboard Lipton L’Othian. Photo By: Carrie Wirth/Phelps Media Group. Wellington, FL – September 4, 2013 – There are more than 28 million children of alcoholics living among us, but there is only one organization that brings smiles to their faces weekly by joining them with horses and mentors: Horses Healing Hearts (HHH). The inspirational national non-profit organization is proud to announce that Olympic Gold Medalist Peter Wylde has joined Horses Healing Hearts as their first Show Jumping Ambassador. The first of its kind, HHH was founded in September 2009 by Liz Olszewski of Wellington, FL, and helps ease the pain of kids growing up in a home with substance abuse. Horse Healing Hearts provides these children with the opportunity to help heal emotionally by working with horses while having fun and learning positive life-coping skills, responsibility and confidence. Using equine experiential learning, HHH is the only program in the nation that works with the specific demographic of children of alcoholics and addicts. These gentle giants help them understand life, themselves and how to cope with their parents’ addiction to substance abuse. Since then, he has won some of the most prestigious titles in the world of show jumping including the President’s Cup at the Washington International Horse Show, the $100,000 Rolex/USET Show Jumping Championship at the Bayer/USET Festival of Champions, the $50,000 FedEx Gold Coast Grand Prix, and a Grand Prix at the FTI Consulting Winter Equestrian. In 2002, Wylde and Fein Cera represented the United States at the World Equestrian Games in Jerez, Spain, where they won the individual bronze medal and Fein Cera earned the coveted “Best Horse” honor. In 2004 the pair was again chosen to represent the United States at the Olympic Games in Athens, Greece, where they won the team gold. Wylde is the Head Clinician and Vice President of the United States Hunter Jumper Association’s Emerging Athletes Program, which seeks to identify and cultivate equestrian talent and reward horsemanship skills to aspiring young professionals. Together with his partner Eduard Mullenders, Wylde runs Mullenders & Wylde Horses LLC, a Millbrook, New York-based training operation for top level horses and riders with a concentration on providing the highest level of care and training for the horse. “HHH could not be more proud to have a leader in the industry like Mr. Wylde on board. With his history of already giving back to youth, his involvement seemed like a natural fit. We’re looking forward to a long and fruitful partnership helping these kids understand they are a product of their decisions and actions, not of their circumstances,” commented Liz Olszewski, Founder of Horses Healing Hearts. Horses Healing Hearts is a 501(c)3 not-for-profit organization dedicated to bettering the lives of children of alcoholics and substance abuse through equine experiential learning. To learn more about Horses Healing Hearts or how you can help with donations of money or time, go to http://www.HHHUSA.org or e-mail Liz Olszewski at liz@hhhusa.org or call (561) 713-6133. Peter Wylde guided Lewin 5 to victory in the $30,000 Battenkill Grand Prix. Photo by David Mullinix Photography. East Dorset, Vermont — Olympic gold medalist Peter Wylde and Lewin 5 sped to their second Grand Prix victory in a row at the Vermont Summer Festival, winning the $30,000 Battenkill Grand Prix, presented by Johnson Horse Transportation, during week two of the six-week show jumping competition. The Vermont Summer Festival continues through August 11 at Harold Beebe Farm in East Dorset, VT.
Wylde edged out student Agatha D’Ambra and Udiana for the first place finish with just over a second to spare. D’Ambra and Wylde were the only riders to advance to the jump-off out of the 22 entries that contested the Grand Prix. Wylde also qualified on his second mount, Wiesielotte, but settled for third place after incurring 12 faults in the jump-off. D’Ambra was thrilled with her mare Udiana’s performance and was more than content to finish second to her new trainer. “Coming in second place at all is incredible. I’m very happy with it. My horse was brilliant today. I couldn’t be happier with her. Peter Wylde is the best, so just the fact that I came in front of his other horse and presented a challenge for him, I’m pretty proud of myself,” D’Ambra beamed. D’Ambra was first to return in the jump-off and Wylde admitted to doubting whether he would be able to catch her after a perfectly executed second round. “She nailed the jump-off and I thought, ‘I’m going to have to really go if I’m going to get it.’ I think the only place I caught her was to the last fence. I really raced to the last fence. I think I was probably a little bit behind her going into the last fence but I made up some ground there. She was pretty much perfect in her jump-off,” Wylde revealed. Wylde described how Lewin 5, an 11-year-old gelding owned by Société Civile de l’Ecurie Meautry, has come into his own the last several months of competition. “Lewin’s been consistently right at the top the last grand prix and the last few months I’ve been riding him. The horse is fantastic and this is now the third grand prix he’s won in the last two months,” Wylde explained. “I’ve ridden him for a year and a half now and he’s really developed into being a superstar. It’s exciting! He’s fun and he’s also learned to go fast. He’s got a lot of self-confidence now and I can pretty much ask him to do anything and he’ll do it for me. He really is there for you,” Wylde continued. Wylde and D’Ambra’s partnership is newly formed, yet the pair is clearly well-matched. D’Ambra of Saratoga, NY, contacted Wylde when she heard he was moving his training business to New York. “I sent him a message saying I needed a trainer and I needed some help and he said he’d love to help me. I shipped in for a lesson two weeks before HITS Saugerties and it was just an immediate click. I think it’s pretty obvious in the results that we share the same philosophy with the horses and that we get along really well. I see really good things coming,” D’Ambra shared. Both riders were extremely grateful for the support of their sponsors, whose invaluable support enables them to compete at the highest levels of the sport. “I want to thank my sponsor John Cooley at Elite Equine Veterinary,” D’Ambra said. “I would also like to thank my sponsors Cavalor, Dover Saddlery, Tredstep and of course Tad Coffin Performance Saddles, which are the saddles I’m using on my horses now which I just love and my horses love, too!” Wylde added. The Vermont Summer Festival, celebrating its 20th anniversary in its current Manchester location, offers more than $750,000 in prize money, making it the richest sporting event based on purse in the state of Vermont. The first five Saturdays of the Vermont Summer Festival feature a $30,000 Grand Prix. The $50,000 Vermont Summer Celebration Grand Prix will be held during the sixth and final week on Saturday, August 10. The weekly $10,000 Open Welcome Stake, Presented by Manchester Designer Outlets, is held each Thursday. The hugely popular $5,000 3’3” Hunter Derby is also held each Thursday for the first five weeks, with week six featuring the $15,000 Hunter Derby. The Vermont Summer Festival is a proud member event of the Show Jumping Hall Of Fame, the Marshall & Sterling League, and the North American League (NAL). For more information about the Vermont Summer Festival, please e-mail info@vt-summerfestival.com or visit www.vt-summerfestival.com. Peter Wylde guided Lewin 5 to victory in the $30,000 Vermont Summer Special Grand Prix. David Mullinix Photography. July 6, 2013 – East Dorset, Vermont – Peter Wylde made his first trip to Manchester, VT, a winning one by claiming victory in the $30,000 Vermont Summer Special Grand Prix on July 6. The six-week Vermont Summer Festival is running July 2 through August 11 at Harold Beebe Farm in East Dorset, VT.
A veteran of the United States Equestrian Team, Wylde was the individual bronze medalist at the 2002 World Equestrian Games in Jerez, Spain, before claiming team gold at the 2004 Athens Olympics. Having been based in Germany for the past 12 years, Wylde recently relocated his business to Millbrook, NY, and is back competing on the U.S. show jumping circuit. Wylde included the Vermont Summer Festival on his 2013 tour schedule. The decision proved to be a wise one, as he was one of three competitors to advance to the jump-off over the track set by course designer Alan Wade of Ireland. Agatha D’Ambra also jumped clear with Quivola, but incurred two time faults for exceeding the 86-second time allowed. Returning first for the jump-off, Michael Dorman posted a clear round in a time of 40.31 seconds riding Zephyr to put the pressure on those who followed. Mark Bluman, the winner of Thursday’s $10,000 Open Welcome Stake with G&C Lagran, was next up, this time riding G&C Carla. Bluman only began riding the grey mare two weeks ago, having been given the ride by his brother, Ilan. In their first grand prix together, the pair posted a clear round in 36.16, despite a big stumble upon landing after the second fence, taking more than four seconds off of Dorman’s time to move into the lead. Wylde was the third and final challenger, and the seasoned veteran made short work of the jump-off course, smoothly guiding Lewin 5 over the fences, around the turns and through the timers in 34.39 seconds for the victory. The win in the $30,000 Vermont Summer Special Grand Prix marked the second recent victory for Wylde and Lewin 5, an 11-year-old bay German-bred gelding by Lewinski owned by Baron Eduard de Rothschild of Société Civile de l’Ecurie Meautry in Deauville, France. The pair also won the $35,000 Garden State Grand Prix in Augusta, NJ, on May 4. The grand prix was the first class of the week for Wylde, who arrived in Vermont the night before. Wylde will remain in Vermont for the second week of the Vermont Summer Festival, and is already making plans to return next year, saying, “I haven’t been here before and this was the plan that I devised. Next year, I’ll be tailoring my plan based on experience, and I’m already having a great experience here. I love the grounds and the layout. “It’s only been a few months, but I’m basically up to speed with where I want to be,” said Wylde, who is now basing his business, Mullenders & Wylde Horses LLC, out of Winley Farm in Millbrook, NY. “I’m really happy with the way things have fallen into place for me since Florida. Winley Farm, in my opinion, is the best training facility I’ve ever been to. It’s an old thoroughbred breeding farm on 190 acres with paddocks and riding trails. Built in the middle is a high-tech show jumping training facility with 40 box stalls. I’ve never seen this combination of high-tech stable with so much turn-out and grass. I’m so happy and my horses are so happy, which is obvious because they have been performing so well. “I would like to say thank you to my sponsors, Dover, Cavalor, Tredstep and Tad Coffin Performance Saddles,” concluded Wylde. 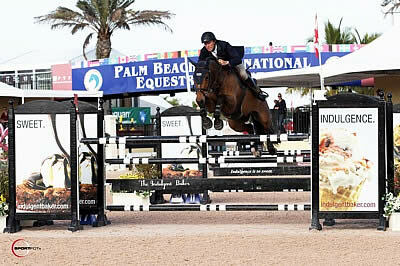 Wellington, FL – February 6, 2013 – The fifth week of competition at the 2013 FTI Consulting Winter Equestrian Festival (FTI WEF) began on Wednesday, February 6, with a win for Peter Wylde and Zidane in the $8,000 G&C Farm 1.45m speed class. The pair also topped the class during week three and Wylde hopes to continue their success in the Rolex FEI World ranking classes coming up in the remaining weeks. Week five of the FTI WEF circuit, sponsored by Adequan, will run February 6-10. The week will feature the $33,000 Ruby et Violette WEF Challenge Cup Round 5 on Thursday afternoon, the $82,000 Adequan CSI 2* Grand Prix on Saturday evening, and the $25,000 Suncast 1.50m Championship Jumper Classic on Sunday afternoon. The 2013 FTI Consulting Winter Equestrian Festival features 12 weeks of competition running from January 9 – March 31, 2013, and will be awarding almost $7 million in prize money throughout the circuit. Olympic course designer Bob Ellis set the track for Wednesday’s $8,000 G&C Farm 1.45m speed class in the International Arena at the Palm Beach International Equestrian Center. Thirty-seven entries competed and 13 cleared the course without fault. The fastest round in 56.335 seconds earned top prize for Peter Wylde and Zidane, owned by Windward Farm and Jessica Suida.